Denny Jump (Bellevue, WA, United States) on 7 October 2010 in Landscape & Rural. Say hello to Cap Rock. This popular spot is located right alongside one of the park roadways. 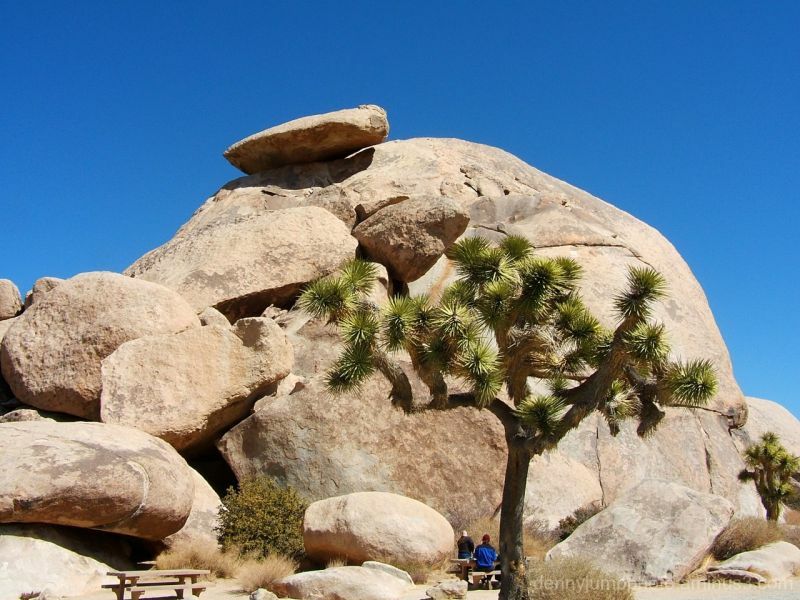 It is but one of many rock formations in the park that feature a "cherry" (or cap in this case) on top! I left the picnic table and "Turistas" in the frame so that you could get an idea of the scale of the rock which, as you can see, is quite large. Another great shot of Joshua Tree! The people add perspective...but I like the “cherry” on top the best. I always wonder how that happened? You are right about the trees...they are dying off and it’s so sad. The Aspens are facing a similar danger...climate change is here, whether it be man-caused or Mother Nature one does not know...I just know it’s here and we need to do what we can to keep what we have. @Cruz: Hi Cruz -I totally agree. The Glaciers, the plant and animal life...everything is changing becasue of the climate changes it seems. I think one thing we can do as photographers is try to document and preserve in a pictorial way so that the evidence can be seen. Seeing is beliebving. Listening to some guy rant on either side of the issue tends to be a turnoff to the "opposing" view...but if we SEE it, perhaps we will be convinced. I wonder what kind of tree that is. Just kidding. @Tamara: Hi Tamara! Thank you so much...it is great to hear from you - I love your fireworks today Great work! Best wishes to you! I was just looking at some of my Joshua images on Tuesday. A fabulous destination and you've captured its scale perfectly here with that couple. Nice work Denny. @Stephen Phillips: SOme salami, cheese, bread and wine (for the Mrs...Martinelli's for me) And voila c'est complete! @john4jack: Hi Jack - Thank you - and yes this spot is right the corner of where you turn to go to Key's View...right off the main park road. I usually try so hard to eliminate tourists from my travel shots, but you're right, this adds great perspective. I actually thought the trees were much smaller. @Andrea: Hi Andrea- I agree about the rocks , ayyy! ..Re the tree, there's a bit of "dof" going on here - the tree is closer than the rock, so the tree is actually (and probably) NOT as big as it appears...usually Joshuas that are kinda healthy like this can one grow to about 20 ft high...sometimes a little more but not usually. I would say this one is about 18 feet Thanks Andrea. ah yes - a bit perspective - This is great! - I'm such a paranoid - I would likely move from beneath those rocks that appear to be sitting rather vicariously. : ) Love the shot. @Becky: Is that what it's called? Well there ya go..a little bit of bit. Thanks Becky - hope you guys are doing ok.
Prachtige foto van een bij ons onbekende boom, mooi. Beautiful picture of a tree unknown to us, great. @roy: HiRoy -I thank yu so very much. I really like your image shwn today as well . Thank you! Very nice capture! I like the composition Denny, however, I would like to have seen the base of the foreground Joshua tree, yet it is still a very fine image. @Bill Brown: Yes I agree Bill - last night - late-after I realized that I really should show some scale, I hurriedly replaced the one I had of this rock with this one because in the the other one, I had "eliminated" the people in Aperture3 touch up. In my haste I forgot to do a "sanity chack" on the rest of the frame - simple as that...So I totally agree about the bottom of the tree...as the saying goes, "haste makes waste." The people definitely add perspective. Nice shot. @B. Thomas: Yes they do - this was a last minute decision and switch and I am glad I made it - Thanks Barbara! What a picnic site! This is beautiful. I love the colours and detail. @✿ Anina ✿: Absolutely, it is a wondrous place to be -Thank you Anina! Where's Roy Rogers and Hopalong Cassidy? A lot of those old serials were shot here. You would recognize the rock formations. @Wilson of Waterbury: Hi John - Thank you very much. Yes, many westerns were filmed in this area but I believe that most of the Gene Autrey/Roy Rogers/Hopalong etc ones, believe it or not were filmed not far off of what is now occupied by I-15 between San Bernardino and Victorville along the "Back side" of the San Gabriel mountains..if you ever drive up I-15, in that area you can see those familiar smooth but pointy and slanted rocks where all those gunfights took place. Another nice composition Denny. You are batting 1000! @Julie Brown: Hey Julie - Thank you ;-) I really liked your photo today ! Excellent! including the people makes this image even more appealing due to the incredible size of the rock! @Tracy: Hi Tracy - Thank you so much.Have a great weekend! Lovely shot...Great scale shown here..Like the tree. And the blue sky looks good. I am basically a "cloud" person who prefers clouds to empty sky.. But this time, you have captured the empty blue sky so nicely ..You are "converting" me - to start liking empty blue skies. I wonder if some prehistoric man or beast moved it up there. would like to be enjoying it on one of those benches. That rock is huge! Great shot. I don't think I would be sitting at them benches! Really cool shot!